For any bike boffins – here’s a quick boffin update: a few months ago my first Roberts (a ‘hot pink’ one which I first sat upon in late ’88) underwent a facelift care of Chas and Brian at Roberts Cycles. It is now a shiny bruised bashed-about-looking blue-black with a Rohloff hub. My Shimano XT rear derailleur had taken me far and wide without a hitch so I took some persuading to swap it for a Rohloff. When I first set eyes upon my new fat hub I peered at it a tad suspiciously – after all – what on earth goes on in there behind all those closed curtains of wrapped metal? In the event, it took me all of a good … ooh … thirty seconds to become an immediate convert to the super-gear-gliding ease and joy of it all. And all in one hand too! Admittedly, things took a little while to bed in – mostly the middle gears around 6/7/8 which were a bit noisy for the first 500 miles or so, but nothing that bothered me unduly – after all, Molly makes far more cooing, tra-laaing chatty racket attached to my rear so rather handily drowned it out. 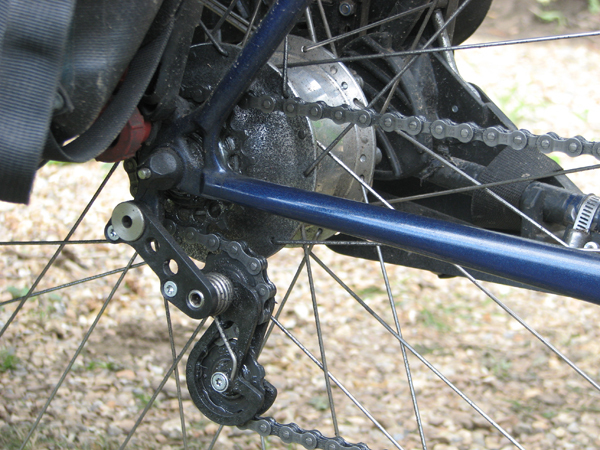 Apart from it all being so easy on the gear-changing front, one big benefit is that whereas derailleurs eat chains, Rohloffs don’t. I have yet to test it in lands a-far but that’s where I ultimately aim it to go with my boisterous cargo attached. Meanwhile, apart from a flurry of poppers popping their poppers and some weak and wobbly stitching on the flagpole-mounting pocket (all easily self-mended), my Burley trailer continues to come up trumps. This Molly Mobile has hauled the aforementioned and ever-weightier Molly some 3000 miles over local and not-so-local hill and pothole. 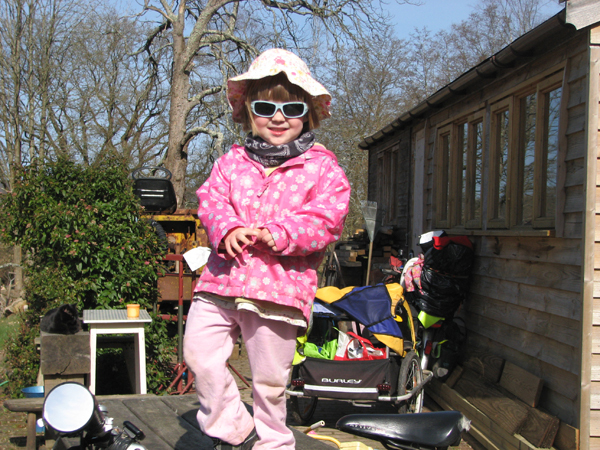 Her seat on my rear rack now seems to act mostly as a receptacle for carrying her potty, though I’m pleased to say she’s learning fast to go at the roadside or behind a conveniently positioned bush in true cycle-camping manner. Over on another foot (any toe-clipped or clip-less will do), for those interested in the CTC (Cyclists’ Touring Club’) I have now had what is apparently called my Vice Presidential ‘induction’ – luckily nothing to do with bringing on a birth but more to do with meeting all those at the handlebar helm at CTC HQ in Guildford and hearing what a sterling job they do for cycling King and country. Then at the end of April, I dragged the builder and Molly up to Chester with me for the club’s AGM and National Dinner. I was expecting to be crawling around on our hands and knees sleeping in a waterlogged tent (much like at the York Rally), but instead we were put up in the swanky and centurion-themed Queen Hotel where we thought it was only polite to unleash our bottomless-pitted cyclists’ appetite at the breakfast bar. We survived an hour of the three-hour or so AGM (full of special resolutions and ordinary resolutions and proposers and proxy voting and the odd punchy ex-councillor) but AGM’s are not made for two-year-old Mollys (especially not freshly toilet-trained ones) so we slid out of the back and wandered off to the market square where there stood a colourful cluster of cycling-flavoured stalls (CTC, Chester Cycling Campaign, Sustrans etc) advertising the merits of cycling and all throwing freebies our way. At one point I was intercepted by a friendly woman who wanted to shake my hand and thank me for writing my books (I think there must be something in the Chester air that can make people act a little light-headed but I enjoyed the moment while it lasted) and then she shook the builder’s hand to thank him for being the man who slowed Josie Dew down. 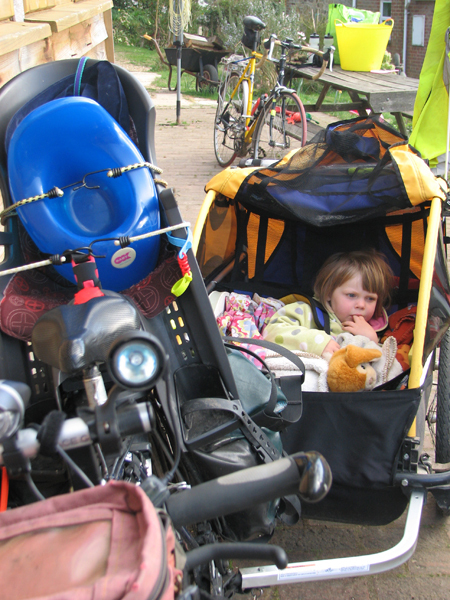 I assured her it was only a temporary slow-down and that once Molly was big enough to fit on the back of my tandem without toppling off to starboard things will speed up again. Have seen you round Shottermill (my home village). Your article explains why, when I went to see Chas Roberts at his Croydon shop, his photos showed you with a bike of different colour. Hope to make it to your Milland talk (weather permitting) on 31/1/13. You are such an inspiration Josie, I just got back from my first trip down through Devon and Cornwall and am planning to bike the Isle of Wight next week. It seemed like you enjoyed it with your Mum despite the weather. I am really looking forward to your next book! One thing I always wonder is how you wash up your porridge pan when you are wild camping as I never have enough water to spare with me to be washing up so I tend not to cook. How do you manage to get your washing dry in this country? Silly questions I know but I do wonder! Thanks for the wonderful writings and inspiring me. Safe travels and a following wind! 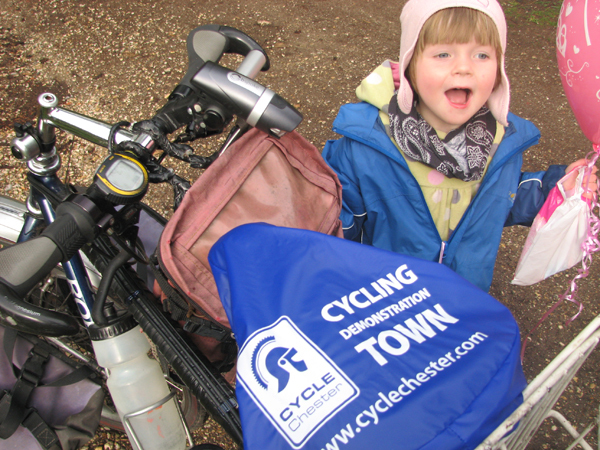 Glad you enjoyed my books, Jessie, and they haven’t put you off cycling – despite the weather. Porridge pan washing? – I scrape and eat every scrap off the bottom and then use a bit of water from my water bottle to get it properly clean – or sometimes I just find a tap somewhere. As for drying washing – I hang it off panniers and tent guy lines if it’s not raining. I also rig up a makeshift washing line from the inside roof of my tent. Thanks for the advice Josie. I toured the Isle of Wight this week mainly on the cycle routes but the traffic was appalling. I guess its worse in August but it really spoilt the trip. Do you have plans to come and do a talk in Brighton Josie? I really look forward to your next book!! How is the Rohloff rolling these days Josie ? I have a Thorn no ad Rohloff equipped. Cannot fault the bike or the hub !